This week the Elf made their third successive away trip, this time down to the Solihull region of the West Midlands against usual May opponents Lapworth. 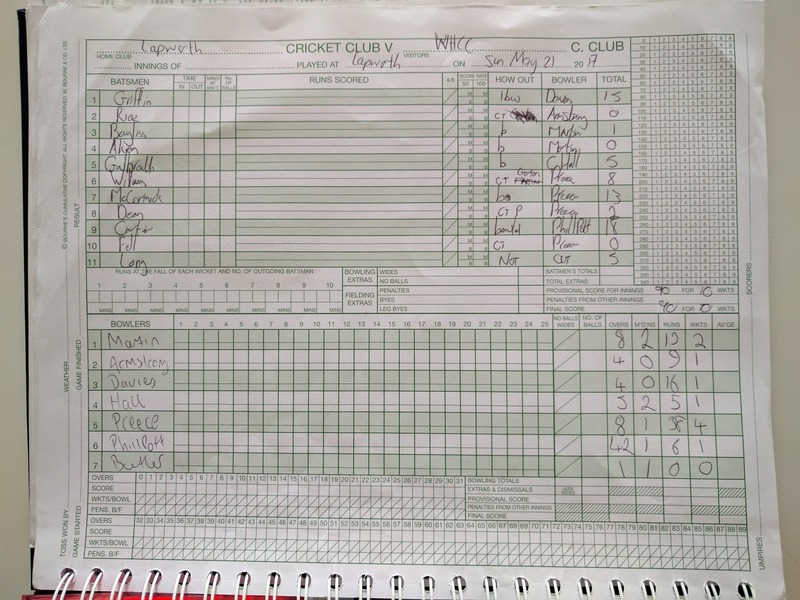 With only 10 men the Elf were in the field first and got off to a quick start when Dan Armstrong bowled a bouncer (on a slow deck) and somehow the opening batsmen spooned a catch to Chuck at first slip. Opening partner Nath Martin/Larkin picked up two wickets, the first one being an absolute peach to remove the batsman’s middle stump out the ground for a full pint! Martin bowled with 8 overs straight through and only went for 13 runs including a top edged six which deserved a BIG HAND. The Friar Park express is already in contention for player of the season for some excellent bowling and fielding displays early doors. Tom Davies and Chris Hall came on at first change bowling nine overs between them, Chally picking up a wicket through the gate and only going for five runs off his five overs. Tom Davies got an LBW (CAN YOU BELIEVE IT?) after he screamed at umpire Tim Fell until his finger was raised after having a close call turned down the previous over. Davies was seen googling for ‘DRS’ equipment at the interval. With the hosts 40-5. captain Chuck turned to everyone’s favourite left arm spin bowler JP. On 46 wickets for his Elf career, JP needed four to reach the fifty milestone and that’s exactly what he did by spinning the Lapworth middle to lower order in knots, JP got the next four wickets and Lapworth were staring down the barrel at 68-9 but a good last wicket partnership between Carter and Long saw the hosts get up to 90 before spin demon Greg Phillpott came on and got the last wicket, the second of his season. After the lads loaded up at tea due to no fielding required after, the Elf knew batting on this pudding of a track would not come easy so Alex Nunns and ‘pinch-hitter’ Dan Armstrong strode out for the visitors. It wasn’t long until the experiment was over, Armstrong getting a good one from McCormick and went back to the club without really using his new £250 bat. Gort came out at 3 and saw off some good deliveries off the dangerous McCormick until Nunns cheaply chipped him to cover and was out for 15. Greg Phillpott was in next fresh off some runs the previous week but all he could do first up was nick off to the keeper and the 10 men of the Elf were staring defeat in the face at 20-3. 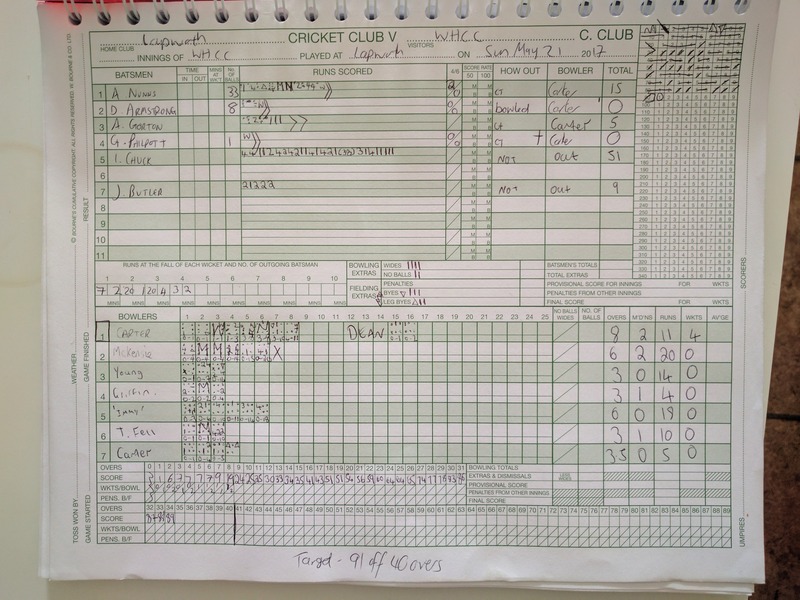 Captain Chuck then entered the fray and had to produce a captain’s knock to see his side home and remain undefeated as skipper. In McCormick’s last over, Gort chipped him to a close catcher and the away side still needed 59 for victory when Josh Butler came in at six and produced one of the best single figure innings in Elf history. Josh nudged and nurdled his way to 9 out of the 59 run match winning partnership with captain Chuckie who made his fifth score of fifty or higher of the season already to lead the Elf home. It really was a top knock from the Kolpak player who is looking in imperious form so far in 2017. The Elf are still undefeated so far in 2017 and have the next week free until they face Blackwood in June for a new fixture. The drinks this week were certainly strong and slightly on the refrigerated side to keep the lads going in the early summer heat. Solid 7/10. The teas this week were certainly of the ‘good variety’ lots of sandwiches on offer both white and brown bread. An abundance of sugary treats to choose from too which went down nicely with the brewed tea in a proper tea pot, once again 7/10. Fantastic result lads and congrats to JP on his 4 for and 50 wits for the Elf. Also another great knock by Chucky. Should we run a sweep as to what Chucky’s batting average will be at the end of the season? Well done boys especially with 10 men kept up the exceptional start to the season .Many congrats to JP🍺. ( Jug hopping? ).